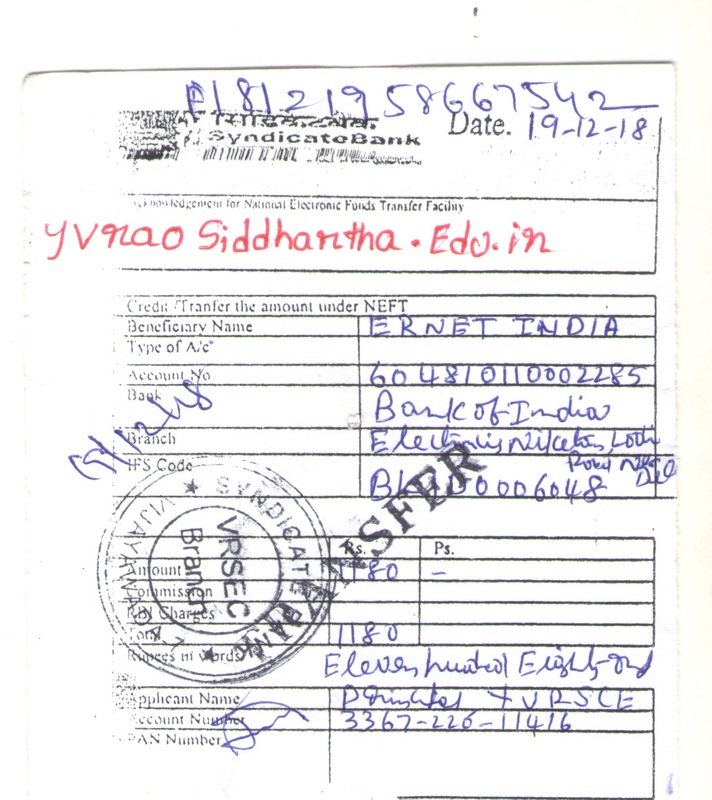 The Siddartha academy of general and technical education,Vijayawada was established in 1975 with a galaxy of enlightened and elite persons of Andhra Pradesh by which the educational map of Andhra Pradesh which was an education Sahara turned into an epitome of education of Andhra Pradesh.The academy has been running 15 educational institutions pertaining to school education for Intermediate,Degree,PG Levels,Engineering,Technology,Law,Teacher Education, Medicine,Nursing,Pharmaceutical,Dental etc. The dreams of common man for higher eduction is brought at the door steps of vijayawada by the academy. As a results, Thousands & Thousands of students have been persuing their education in vijayawada. With an ambition to provide pre-service training to the youth of Andhra Pradesh.The Academy established Y.V.Rao Siddartha College Of Eduction in the year 1983.The fisrt batch of Students Commenced their Training Programme in the year 1984. Since then the college has been producing thousand of B.Ed Trainees to serve the nation as a Teacher-Nation Builder. 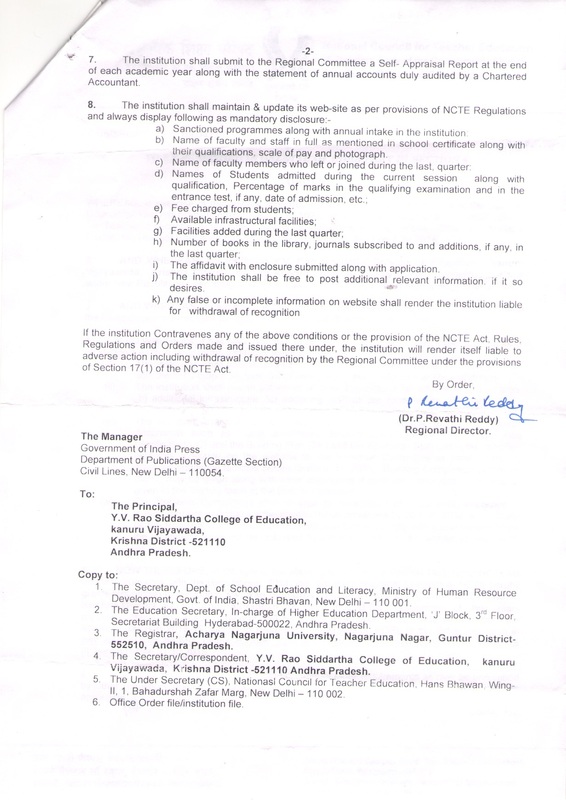 The Y.V.Rao Siddartha College Of eductionhas been contributing to the advancement of intelectual and human resourses capacity of the nation through Teacher Training.The faculty believes that the quality of education,life in general is dependent on the quality of the teacher in the classroom. The Y.V.Rao Siddartha College Of Eduction, Vijayawada was established in the year 1984 to provide a pre-service training at secondary level (B.Ed Course).It was inaugurated by Prof.K.Rama Mohan Rao,the then Vice-Chancellor of Nagarjuna University on 23rd January, 1984. The inaugural function of the new college building was presided over by the Vice President of Siddartha Academy of General and Technical Education Sri Garapati Venkateswara Rao, Hon'ble Minister for secondary School Education,Andhra Pradesh,Sri Devineni Venkata Ramana Inagurated the new building. 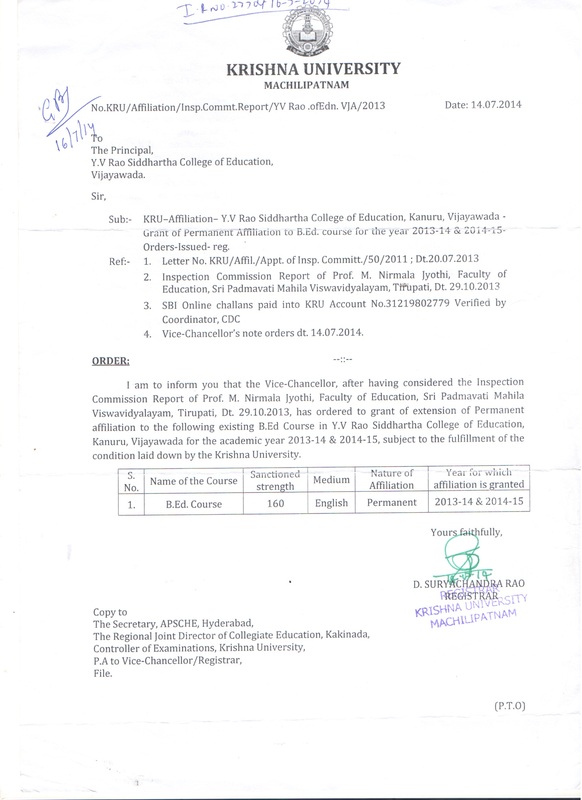 The College was renamed as Y.V.Rao Siddhartha College of Education on 10-02-2000. 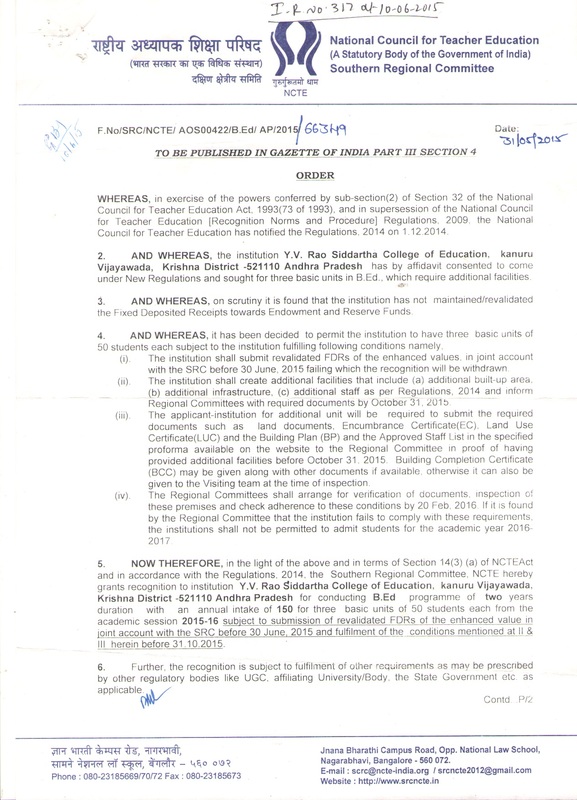 Approved by National Council for Teacher Education and is accorded permanent Affiliation by Krishna University.